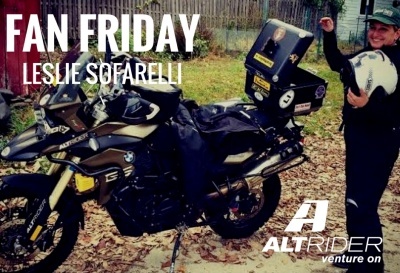 Our latest Fan Friday rider, Leslie Sofarelli, is a true motorcycle fanatic. Originally from Long Island, New York, Leslie headed north to British Columbia in 1998 before returning to New York in 2015. She’s been riding since before she can remember, at the age of four, on the same model of Honda 50 that have started many riders’ lifelong passions for the sport. Leslie has owned 10 bikes over the years, ranging from a Suzuki 80, Suzuki DR-Z125, Kawasaki KX100, Suzuki GS 500, BMW F 650 GS, and a BMW R 1200 GS. 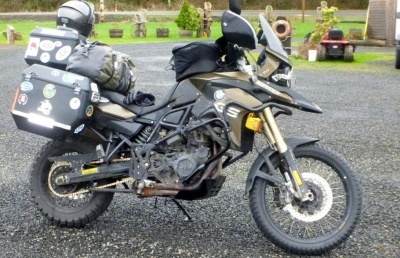 She currently owns a BMW F 800 GS which is kitted out with AltRider parts and accessories. Sofarelli’s dream ride would be traveling from Northern Ireland all the way to South Africa. With the rig she’s got, it’s only a matter of time. Her F 800 GS is a showcase to the variety of AltRider products, from our Synch Dry Bags to a whole slew of protective parts. “I love the chain guard, crash bars uppers and lowers and rear brake master cylinder guard. It’s good to have heel protection on both sides and head light protection is great. The parts are easy on and easy off. I love them all and trust me I've tested out the crash bars. I really appreciate Jeremy's support of myself, my bike and my riding too,” said Sofarelli. Stories like Sofarelli’s are what keep us going here at AltRider – we truly do what we love in the hopes that what we build can help you follow your passion too. Until next time, venture on.